I took along my friend Kath (pictured below in all her fabulous feathered finery) – both of us lugging a series of heavy bags and suitcases on and off three different trains and one marvelous red double decker bus. At Birmingham, a woman stopped Kath to say, “I just have to ask – where are you going? Where have you been? You seem to have your whole life on your back.” To be fair, the various things dangling from her rucksack did include an enamel jug and a brightly coloured rag rug. We are the kinds of friends who pack ample amounts of pre-ground coffee (plus wine, whisky and all the ingredients required for a kind of elderflower collins/ mojito hybrid), but forget the basic necessities like torches or loo roll. When we finally got onsite, there was a minor disaster too – one of our tent poles snapping as we assembled our little home for the next four days. Luckily it wasn’t fatal, but did mean that our tent stayed bent at a rather amusingly wonky angle all weekend. It listed to one side like it was slightly drunk. But it did what it needed to - kept us warm and dry and gave us somewhere to sleep. We made scrambled eggs there in the morning, drank our coffee, did our make-up and had afternoon naps with increasing regularity as the previous night’s antics caught up with us. I’m fascinated by how festivals function. If you take a step back and think about it at any great length, the whole situation is kind of bizarre – thousands of people all spending three or four nights together in a succession of fields, often wearing the most outlandish and fabulous outfits. 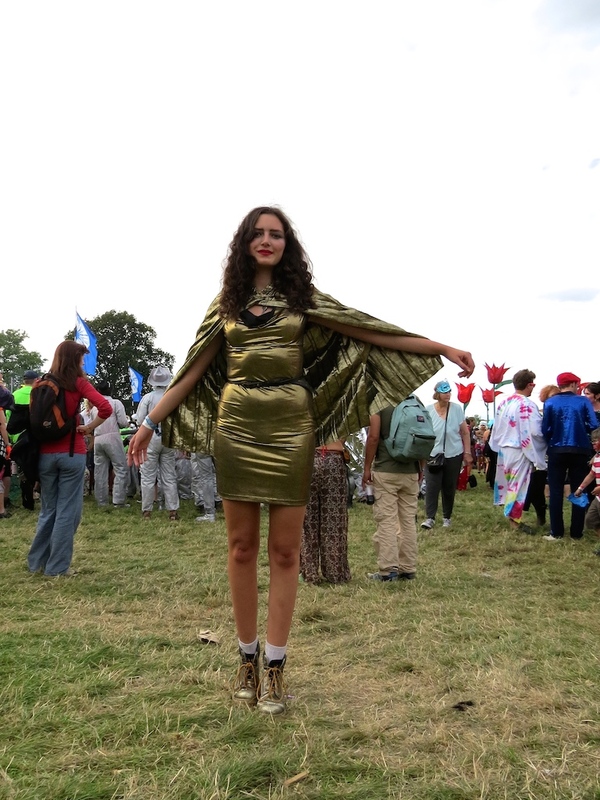 In fact, Shambala is the kind of event where you look kind of out of place if you’re not wearing something intensely shiny/ embellished/ layered/ ridiculous. Spend five minutes people-watching and you’ll see several brilliant fancy dress inventions (think everything from mermaids to cosmic order police), the odd wedding gown, huge amounts of body paint, several guys in frilly dresses, someone with a liquid eyeliner moustache, and endless teenagers in brightly patterned jumpsuits. It’s also one of the few spaces where your job, status and financial situation are all entirely irrelevant. They might be mentioned in passing, but the usual boundaries of day-to-day life – the things we use to anchor and define ourselves – tend to be lifted. It’s the perfect modern day embodiment of Bakhtin’s concept of the carnivalesque. In a piece for Ceasefire magazine, Andrew Robinson writes that the carnivalesque ‘is a kind of life shaped according to a pattern of play. It is usually marked by displays of excess and grotesqueness. It is a type of performance, but this performance is communal, with no boundary between performers and audience. It creates a situation in which diverse voices are heard and interact, breaking down conventions and enabling genuine dialogue.’ Later he notes that ‘it is a brief moment in which life escapes its official furrows and enacts utopian freedom... Its defining feature is festivity – life lived as festive.’ To me, that seems very close to the environment created by music festivals – full of play and performance and crumbled conventions. Shambala especially. This was my third year there, and it’s got better with each new visit. We took the ‘life lived as festive’ message very seriously too. All weekend we ate and drank and explored. The absolute highlight came on Saturday – we took part in the cosmic chaos themed carnival (I dressed as a space goddess), marveled at all of the witty, brilliant costumes, and then ran off to the spa. There we jumped between the sauna, the hot-tubs and the hammocks as the sun slowly set – sipping cocktails and watching clouds illuminated in pink and orange. And when we were feeling thoroughly rejuvenated, we danced. In fact, we danced and danced and danced, finally wandering away from the music at 6am in search of chai – which we drank looking over the lake as the sky slowly lightened. Then we ate crumpets and stumbled into our sleeping bags. There’s an absolute euphoria to be found in boogying for hours on end – the kind where you keep on wondering whether you can carry on going, with toes hurting and back aching (at least, if you’re me) but still carried forward by the music and the energy of everyone else around you. A crowd full of sweaty, sparkly, jubilant people with arms and legs flailing. In the past two days I’ve sat down, done admin, made appointments, responded to emails, caught up on article deadlines and begun planning for what September will hold. I’m glad I had that last gasp of jubilant freedom though. To return to that quote above, it certainly was ‘a brief moment in which life escapes its official furrows’ – and oh, it was a glorious moment. Big thanks to CAT footwear for sending me as part of their Cat Festival Diaries campaign. I can indeed confirm that their boots are bloody brilliant for endless dancing in - especially with the added shimmer factor. In fact, my feet are feeling fine after the weekend. It's my shoulders that have borne the brunt of the physical activity - they're killing now (probably good for them to get all that exercise though). On that note, I recently talked to the excellent Nell Frizzell for a piece on back pain for The Debrief. Woah - dancing til dawn? Nice work ladies! Wow. Your space goddess outfit was bloody fabulous. And that sequined gold dress! 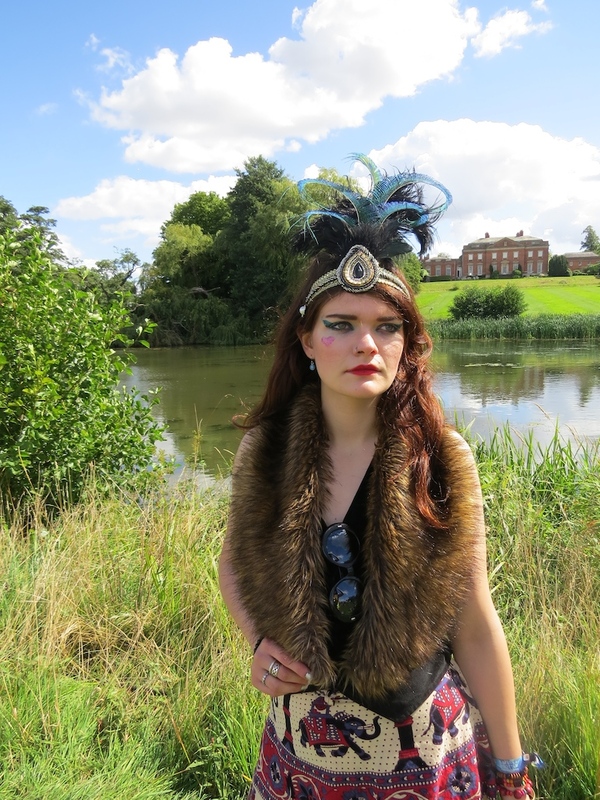 Kath's fur stole and feathered headband! Glorious. I loved the descriptions of your luggage - sounds like you were both quite the spectacle. I always enjoy seeing your festival posts because (unfortunately) I'm very prone to getting something called 'sensory overload' which means actually experiencing live music/crowds makes me feel sick, so the next best thing to going to a festival is looking at these marvelous pictures and reading your evocative recounts of the experience. You and Kath look stunning. I can imagine the fun you had, although the pictures are a big help. Heh. And the writing of course. I love the look of a good solid boot with sequins and shine. Tip re. glitter: clear tape is great for removing really stubborn dots. How could I possibly know such a thing? You both look incredible, you can't beat a bit of metallic at a festival!